Paper and paper-based products such as cardboard are highly sensitive to humidity and moisture levels. Measurement and control of humidity and temperature can therefore have a significant influence on product quality during production, conversion, storage and distribution. Paper is dried during production. The process involves air movement to transport the excess water away. Monitoring of the relative humidity of the exhaust air enables the process engineer to optimize the drying process and energy consumption, thereby ensuring the desired quality is obtained. We offer portable handheld instruments and fixed transmitters that are ideally suited to these processes thanks to their maximum working temperature of 200 °C. After production, the equilibrium relative humidity of the paper is usually measured to make sure it is at an optimum. Certain types of paper require specific values so that they are in optimum condition for final processing. Sword hygrometers offer a fast and convenient measurement of equilibrium relative humidity at very low costs. 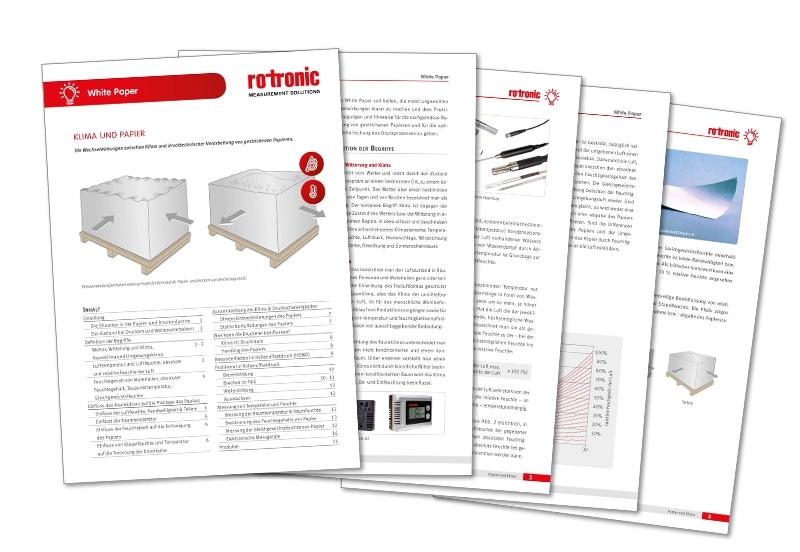 The white paper contains detailed theory about humidity in the paper production and printing industries. It also provides information on where and why it is important to measure and regulate humidity.